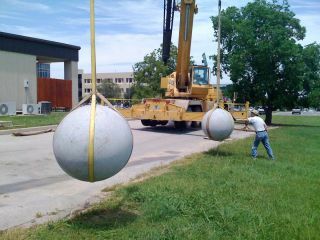 Two 40-foot cranes suspend two granite balls, ready for impact, to mimic asteroid collisions in an experiment at the Southwest Research Institute in Boulder, Colo.
Scientists trying to understand the mechanics involved in asteroid collisions typically rely on the precision of computer models and lines of code. But sometimes, these experiments are best done using mini-wrecking balls suspended from 40-foot cranes. Dan Durda of the Southwest Research Institute, a non-profit organization based in Boulder, Colo., brought the cranes in while trying to nail down part of an equation that determines what happens to the debris that results from asteroid collisions. One of those assumptions, called the coefficient of restitution, is the ratio of the speed of objects before and after an impact. But Durda didn't want to just assume; he wanted hard numbers. "We decided that the best way to do this was just to go do the large-scale experiment," he said. Durda and his team purchased two granite spheres from a commercial supplier. But they knew they couldn't just hang the balls — which were a little over three feet (1 meter) wide and averaged 2,700 pounds (1,300 kg) each — from the ceiling and knock them together. Instead, they hired two cranes to suspend them like pendulums. "The single biggest safety precaution," Durda said, "was to make sure we fully involved the crane operators in the experiment." Although everyone was raring to go when the equipment arrived, Durda made sure to gather the whole team in a conference room to make sure everyone was on the same page. "I really wanted to make it clear to the crane crew that they were an integral part of the team," Durda explained. "I wanted to hear their opinions on what we should or shouldn't do." The two operators took it to heart. They asked questions about the science behind the job, and offered crucial suggestions, Durda said. As a result, they wound up co-authors on the final paper, which was published in the January issue of the journal Icarus. The team decided to start off slowly — very slowly. They began by separating the spheres by only a few inches, concerned that they might inadvertently fracture or destroy the spheres too quickly. By the end of the week, they were using a special winch instrument to separate the balls to the maximum possible distance — which, in retrospect, turned out to be nowhere near far enough apart to even crack them, Durda said. The scientists crashed the spherical boulders together 108 times, though only 66 of the runs resulted in usable data, due to wind shear, camera malfunctions and wobbles. Using high-definition video, they calculated the speed of the balls before and after impact. The result: a coefficient of restitution of 0.83 — more than half again that of the standard currently used. Determining a more precise coefficient has applications beyond simply understanding asteroid collision. These violent cosmic events also affect the formation of planets and their rings. A more precise calculation means a better grasp of how planets are created from the particles orbiting a star, or why the rocks within Saturn's rings behave the way they do. Durda and his team intend to do other related experiments involving objects of varying materials and shapes. After all, perfect spheres are rarely found in nature. Similarly, they plan to test the settling of particles in low-gravity conditions on an upcoming zero gravity flight. But they aren't quite finished with the spheres. "My initial thought was to break them to use their fragments in similar experiments at smaller scales," Durda said. Instead, the researchers wound up using a 50 mm tank gun to shoot golf ball-size aluminum spheres into the granite boulders. "At one point, I was seriously considering using an Abrams tank," Durda said.